Hiking, climbing, rafting, surfing – these are just a few of outdoor adventures women can experience as they travel. These activities might be day trips or the whole point of the trip, but if women are going to get involved in outdoor adventures then they need to dress appropriately for them. When it comes to outdoor clothing, women should remember that comfort and safety are the main goals. To these ends, women travelling for outdoor adventures should check in with sportswear shops and other travellers to find out the most appropriate clothing and equipment for their planned excursions. Depending upon the type of outdoor adventures a woman expects to have, the best footwear choices can differ. For example, hiking boots are essential for women who will be hiking, trekking or hill walking while women who will be learning to raft or surf would want to consider a water shoe. Women engaging in climbing will want to invest in, or rent climbing shoes and women who will be skiing will need to look into skis. Whatever women decide, bringing along a comfortable pair of shoes for wearing after the activity, and a pair of flip-flops that can be worn in communal showers, is always a good idea. Proper clothing will also depend upon the activities in which women will engage, though not quite as much as footwear. Women engaging in outdoor adventures will want to pack sportswear. These items will be made specifically to fit a woman’s frame as well as allow a range of movement, help wick away sweat, and come in easy clean, fast dry fabrics. Sportswear can also easily be layered so that women can add or take away as needed to help maintain a comfortable body temperature. Women who will be engaging in aquatic activities should always look for sports swimsuits rather than fashion suits or bikinis. Sports swimsuits give more coverage, allow for a wider range of motion and often come in more durable fabrics which mean that they generally last longer and hold their shape better. These are important considerations for women who will be spending a great deal of time in the water and in their suits. No matter what type of climate a woman will be travelling within, she needs to pack outerwear. Even a trip to the Equator can get cool at night and when monsoon rains start everyone will be glad they packed a rain coat. Women who are hiking will want to carry substantial outerwear which will serve them well over the course of their trek, and women engaged in winter sports will need to invest in good quality parkas or other outerwear to stay safe in the cold climates. In addition to parkas and rain coats, looking into gilets, jackets, scarves, hats and gloves are all important for staying safe and warm during outdoor activities. 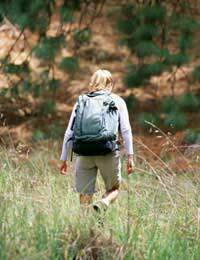 A backpack will be a woman’s best 'accessory' during an outdoor adventure. Many brands now make backpacks specifically to fit a woman’s frame and packs with plenty of pockets will help women carry all of their essentials. Not only will backpacks carry food and water, but emergency supplies, tents, bedrolls, clothes and more. For those engaging in trips specifically devoted to an activity like hiking or biking, backpacks may be the only luggage brought. To ease the burden, women should investigate items with many purposes and items that can be bought and carried in travel-sized containers. If backpacks become too heavy for women to carry then they need to eliminate some stuff. The general rule of thumb for outdoor adventures is 'if you can’t carry it, you can’t bring it' and women will do well to remember it.